With everyone talking about green issues, wearing bio-degradable trainers and biking to work, it might seem strange that most manufacturers are still launching new large SUV vehicles and 4×4’s. Whilst everyone knows these cars are not as bad for the environment as a disposable nappy (at least the cars rot away), the trend first seen in London to brand this type of vehicle as “Chelsea Tractors” has resulted in the sale of 4×4’s in the UK dropping for the first time in years. The SUV market in the USA fell by around 28% in the last year, but manufacturers on this side of the pond clearly still seem to have confidence that these large multi-purpose vehicles are going to remain as popular as “Huggies Little Swimmers”, as the UK market dropped by only around 1% over the last year and that compares to a 4% drop in the market in total, so you could reason SUV popularity has actually increased. As a result a new SUV has entered the Fray and ironically, it has an American name and that’s Chevrolet. OK maybe it’s not actually what you think of as a Chevy and well no its not made in the USA, or even designed in the USA, but if that’s what General Motors want to call it, that’s what it is. When we knew we were being given this car to try, we were naturally very sceptical about it, after all didn’t Chevrolet in the UK, used to be called Daewoo? Nowadays, General Motors own Daewoo and have renamed the range Chevrolet although the Captiva is all new, so never wore the Daewoo badge. In the UK, GM is Vauxhall and Vauxhall also offer its own version of the Captiva which is known as the “Antara”. 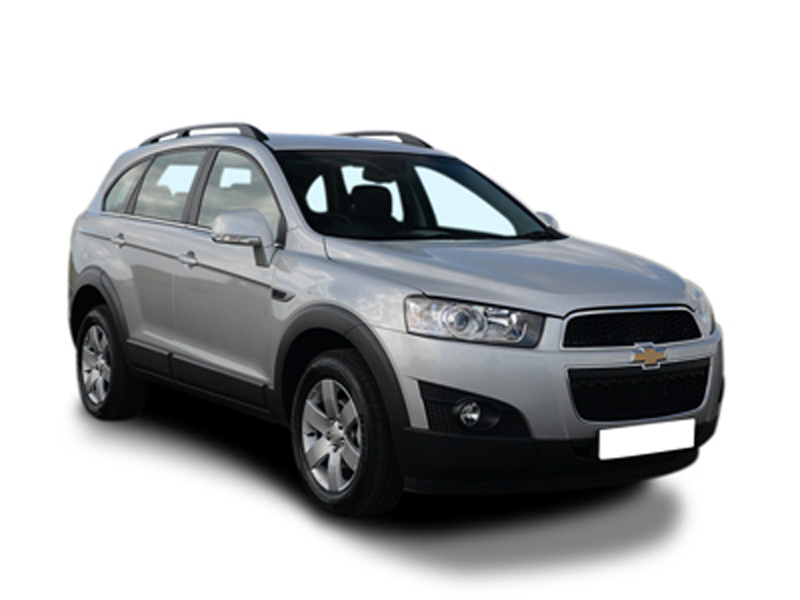 Fact is, plain and simple, the new Chevrolet Captiva is a well built, good looking and attractive car that does the job very well, very well in fact and could well justify wearing one of the prestigious badges. Our car was the range topping LXT 2.0i Diesel Automatic. The first thing you notice is the build quality. Both inside and outside we couldn’t fault the Chevrolet Captiva in any way. Everything opened and shut nicely, the panel gaps were all excellent and the quality of the materials used was first class for the type of vehicle it is. Our car had full leather and was the 7 seat version, although the lead-in models only get 5 seats. For the first time in the UK, Chevrolet has ditched the awful aftermarket CD/Radios and the audio in this car is nicely integrated into the console. The Captiva is an imposing vehicle and one you won’t fail to notice on the road or in your rear view mirror and with a starting price of under £17,000, it offers one hell of a lot of bang for your buck. The Vauxhall version shares the same engine line up and comes in at a start price of almost £20,000, so maybe GM realise the Chevrolet tag doesn’t carry the clout in the UK that Vauxhall does, which means if you are happy to go with the Chevrolet badge, the Captiva offers superb value for money. On the road, inside the Chevrolet Captive is very nice and a really comfortable place to be. The Captiva makes you feel good it “Pampers” you (another nappy joke), as you tower over almost everything else and you really feel you’re driving a car as posh as anyone else on the road and that cant be bad. The level of specification is good for a car of this price. The cars automatic gearbox works well with the 2.0 diesel engine, although you do wonder how such a small engine running through an Auto box can pull this huge vehicle along. Fact is it does and it does it pretty well. Although at 12.2 seconds for the 0-62mph sprint, it isn’t the quickest thing around, it really feels quicker. For such a big vehicle, the Captiva is surprisingly agile and on the open road and cruising at 70mph, it’s amazingly smooth and quiet, with no wind noise and a very acceptable level of road noise. It’s a relaxed unstressed drive, however it’s very easy to find yourself creeping above the legal limit (how does a 2litre diesel do this?). The Captiva achieved a meritable 4 stars (overall) in Euro NCAP testing with 3 stars for child protection, but just 2 stars for pedestrian protection (so you wouldn’t want to walk out in front of one of these). Fuel consumption, on the Auto diesel has is a combined average figure of 32.8mpg, which for a car of its size isn’t half bad but today, with diesel versions of cars like Mondeo regularly returning almost 50mpg combined it makes the Captiva’s 32.8mpg seem a little on the miserly side. That said, this is a very big vehicle. Environmentally, the Captiva Diesel has a Co2 of 197 in the manual versions and 225 in the automatic, so it’s still going to cause the flowers to choke a little as you drive by, but go back just a few years and everything produced Co2 levels much higher than this and even today, the Captiva is no worse than its contemporary’s in the SUV and 4×4 market and certainly no worse than throwing an average of 5,353 disposable nappies in a landfill site in the first 24 months of a child’s life. The cars Co2 rating places it in tax band G along with the Range Rovers, Cayennes and suchlike. It’s wise to remember though that Band G cars may soon become liable for increased parking permit and congestion charge payments if Mr Livingstone and certain local councils get their way – so the cheap Chevy could in the end, turn out to be a rather expensive car to run if you live in the wrong area. Demonising vehicles like the Captiva is really unfair as they are the large, practical family vehicles that so many of us need for our style of life. Whilst we know that every disposable nappy ever made still exists somewhere in a landfill site, that hasn’t prevented people from still using them when a much more ecologically friendly alternative has existed for years. So it’s our opinion that if you need a big SUV, you really shouldn’t be put off and that the Chevrolet Captiva is a good one. Clearly, if green issues are important to you, well you aren’t going to drive a car like this as you can get a small diesel hatchback that produces less than 120 Co2, or even just use public transport. You should use towelling nappies on your kids, holiday in the UK and never fly anywhere. But I hope you don’t the people who want us to stop doing everything they personally don’t like put you off considering the Captiva, as it really is a very nice car in fact its a splendid car at its budget basement price. We commend Chevrolet on a car we really like a lot and a car that offers tremendous value for money and when people moan to you that you’re driving a “Chelsea Tractor” just shout back to them “Disposable Nappy” and see how they like that.